Yesterday on Everyday Food Radio, host Sandy Gluck was talking about sweet versus savoury french toast. I shared with her listeners a recipe for Rajat’s Desi Style French Toast, a spicy, savoury french toast served with ketchup and chutney (no syrup here folks). Of course, I was a bit of a bad wife because I entirely forgot to mention that the recipe I was sharing was actually Rajat’s! Fortunately, he’s a nice husband without much pride of cookery-ship and has agreed to accept rajma for Sunday night dinner in return for my omission. Which I guess brings truth to the old cliche that the way to a man’s heart is through his stomach. I had raved back then in that post about Aloo Chaat Style (Breakfast) Potatoes. Somehow though I never got around to sharing this simple recipe. If you google Aloo Chaat, you will likely land on this wikipedia entry, which is not what “Aloo Chaat Style” refers to. Aloo Chaat is a popular Indian snack usually made with potatoes, chaat masala, chutneys and sometimes tomatoes and onions. 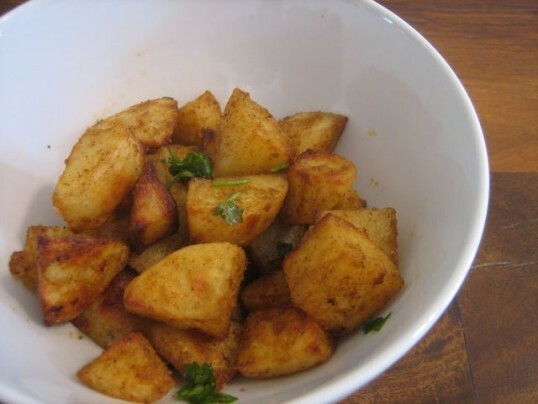 This recipe draws on the tangy meets starch combo taste that makes aloo chaat so popular for simple breakfast potatoes. We’ve made these Aloo Chaat Style potatoes for breakfast, but as I was writing this post we had them again as an afternoon snack. Hence the “(breakfast)”. I wouldn’t hesitate to serve these either for breakfast or just as a snack. Preheat the oven to 425 degrees. Put the potatoes in a big mixing bowl. Drizzle the olive oil over the potatoes. Sprinkle 2 teaspoons of the chaat masala, the red chili powder and the salt over the potatoes. Mix well until the potatoes are evenly coated with oil and spices. Save the mixing bowl because you’ll use it again. Spread the potatoes out on a baking tray lined with aluminum foil in a single layer. Place the tray on the bottom rack of the oven (or whichever is closer to the heat) and bake for about 25 minutes until the potatoes are tender (poke them with a fork to a test). Flip the potatoes halfway through the baking if the tops are getting too browned. When tender, switch to high broil and broil for 10 minutes. Flip the potatoes halfway through the broil if the tops are getting too browned. It’s important to bake then broil these because it makes the potatoes soft on the inside and slightly crispy on the outside. Transfer the potatoes from the baking tray back into the mixing bowl. Sprinkle the remaining 1/2 teaspoon chaat masala over the potatoes. Squeeze about 1 tablespoon lemon or lime juice over the potatoes. Garnish with cilantro. Serve hot. If a spice can bring to mind a season, Chaat Masala makes me think of spring. It’s light and tart with tang, crisp and flavorful. It smacks your mouth and tongue with a sour punch. 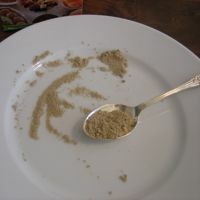 Two other Indian spices that pack a similar flavor are amchur powder (dried mango powder) and kala namak (black salt). Chaat Masala is a mix of both of these plus alot of other sour and heat packed spices like cumin, black pepper, pomegranite seeds, coriander, mint leaves, ginger, chili and cloves. All combined together and then highlighted with a splash of lime juice, they deliver a taste that brings to mind Lik-m-Aid Fun Dip (remember those?!) or sour gum balls. 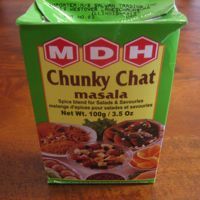 You can find Chaat Masala at any Indian grocery store, and MDH and Badshah are reliable brands. We sprinkle chaat masala on oranges and other fruits for a quick, salty-sweet snack and also mix in a teaspoon with whisked yogurt for raita. What are your chaat masala favorites? That looks incredible. Thanks. Gonna try it this sunday morning (today) for breakfast. Potatoes are welcome anytime of the day in our home. Those chaat style aloo look delicious. Add fried onions (and jalapenos) – this is an all-time breakfast fave in our house! Love this recipe….I like everything that’s gone into it. Chaat masala and amchur are two of my favourite ingredients…. Thanks for the recipe. Made this as an easy dinner with Baingan Bharta (frozen from the Indian market) and Parantha. My wife loved the potatoes, we will be eating this often in the future. ND: Scott, thanks for the feedback! I’m glad to see they turned out well…sounds like a good combination. Hi, i had recently found that your above recipe had been plagiarized on Facebook page by Saqib Jaganhir. I thought i should bring this to your notice, below is link for the proof. Wow, this is such a great website!!!!! Previous post: A Side of Roasted Cauliflower – Dinner Party Worthy?